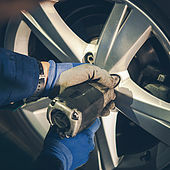 Regular tire rotation is essential in the long-term maintenance of your tires and your car overall. The job of tires on a front-wheel drive vehicle is to accelerate, steer, and help brake your vehicle. Because of this, front tires tend to wear down faster than rear tires - typically twice as fast! Rotating your tires helps ensure even wearing for all your tires. Not only will regular tire rotation improve performance and safety, but you’ll also get more mileage out of your tires and save money in the long run. Drivers should typically rotate their tires every 3,000 - 7,000 miles, but check your vehicle's owner's manual suggestions or your tire's tread wear warranty for more specific guidance. Need a tire rotation? Give us a call or make an online appointment today!